Charlotte was probably the first author who published on Stützel’s work in english, before Johannes Schmidt, Fabian Lindner and Severin Reissl added further introductions in the 2010’s (which we all link for you below). Working on her dissertation in the early 1990s, and having access only to a Xerox copy of Stützel’s 1958 classic, “Volkswirtschaftliche Saldenmechanik”, she recognized the potential of his mechanics of balances framework, including the lockstep concept, for coherently integrating (1) the real and monetary sphere and (2) the micro- and macroeconomic perspective – two long standing problems in the history of monetary economics. 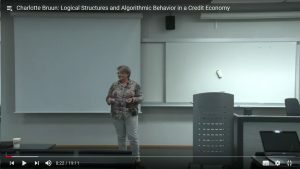 She used Stützels straightforward solutions of these problems as a basis for her treatment of the logical structure of a monetary economy in Chapter 3 of her excellent dissertation, “Logical Structures and Algorithmic Behavior in a Credit Economy”. Charlotte Bruun 1995, Logical Structures and Algorithmic Behavior in a Credit Economy . Ph.D. Dissertation, Aalborg University.